Hearts manager Craig Levein has rubbished rumours he’s ready to walk away from the club in the summer. 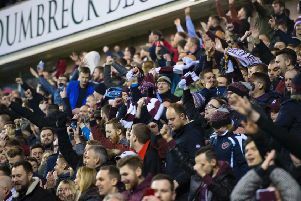 Speaking after the 2-1 defeat to Hibs, the first home loss Hearts had suffered against their rivals in six years, the 54-year-old understood the support’s frustrations. With a Scottish Cup semi-final against Inverness CT coming next weekend, it gives Levein and the players the perfect opportunity to make up for some of the disappointments of this season by competing for the trophy at the end of May against either Celtic or Aberdeen. Levein insists that remains he’s sole focus as he vows to continue on as manager. He told the BBC: “Listen, when we lose to Hibs, I expect to hear boos and nobody’s more disappointed than me. “We’ve got a semi-final next week and the chance to go to Hampden for the final game of the season. My focus is completely on that. So I’ll be here for a while yet. “I don’t know where [speculation] has come from. People say I’m moving to Spain - I don’t even like Spain.